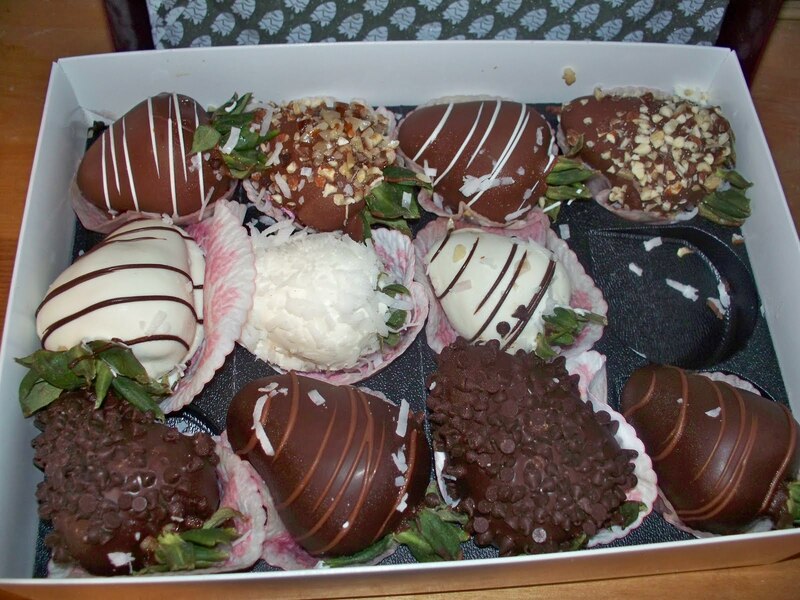 While my darling husband did send me these luscious chocolate covered strawberriesfor Mother’s Day, I still made my own dessert. I’m a glutton, I know. I had just begun my annual reading of Barbara Kingsolver’s Animal Vegetable Miracle, which always gives me renewed enthusiasm for Rhubarb, First Fruit of the Spring. Since mine is always the first thing poking its soft little head up in the springtime and is already, by this cool May day, a tremendous bush, it was inevitable. That I then came upon the sad, strawberry juice-stained page with this beloved recipe on it sealed the deal… and the Breyer’s french vanilla in the freezer was just, shall we say, icing on the cake. 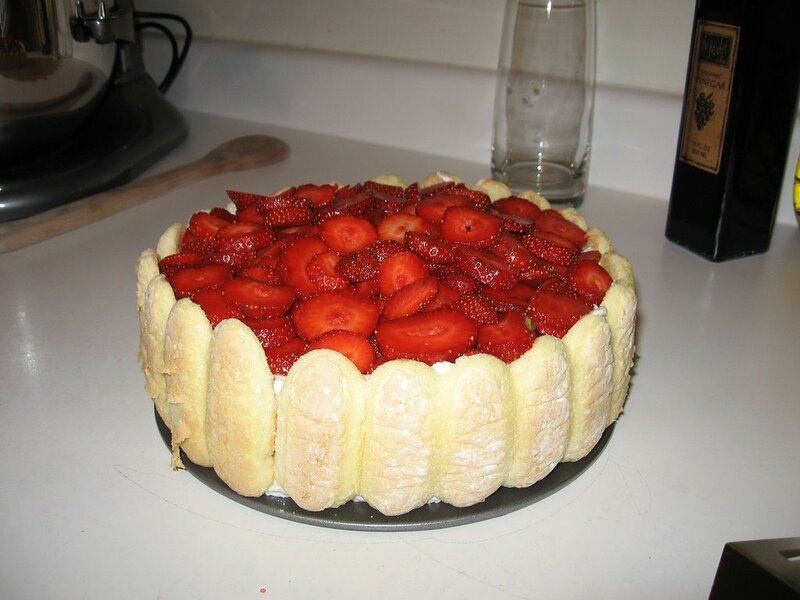 Mix together the strawberries, rhubarb and honey thoroughly and place in an 8″x8″ ungreased pan. Mix the remaining ingredients until crumbly. Sprinkle over fruit mixture and bake at 350° for 40 to 50 minutes, until golden. Try it, my friends. It’s absolutely divine. This is the lovely Dutch baby pancake I mentioned earlier… I will not admit to how many of these Olive & I ate over the weekend…. needless to say, they’re addictive. These little beauties greeted my eyes Saturday morning – tomato plants! One week in the mini greenhouse and here they are, reaching for the dim sunlight of the window. Not too pretty. But hope is coming! In the 40’s this week, to 50 this weekend! Woohoo! 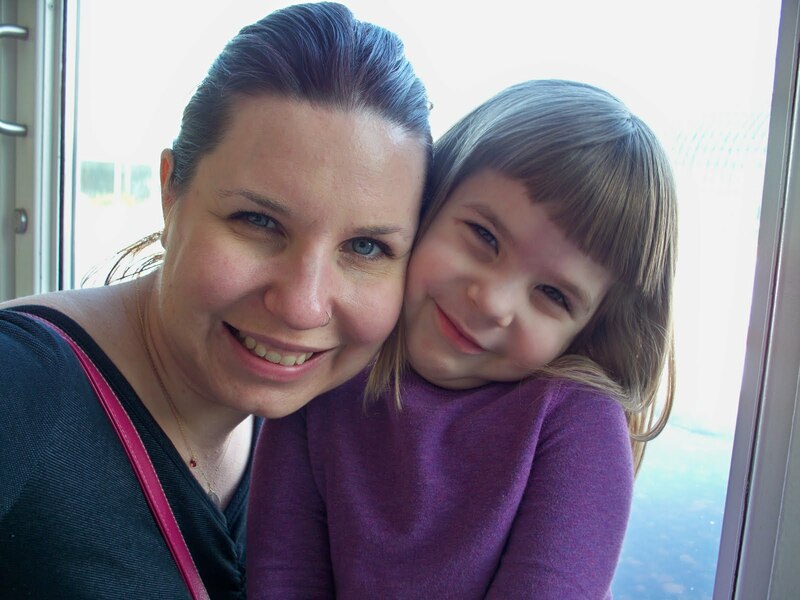 Olive & I hit Como Zoo Sunday afternoon, checking out the monkeys & other favorite friends. The zebras were going nuts (they have less space than I do – poor things! Oh, the cabin fever!). I figured if Olive melted down here – which, since she never regained her sleep after getting 4 hours cut out Friday night, was ever a real possibility – it wouldn’t be such a big deal. Who’d even hear her over the chimps? Sidelight – why do kids never sleep extra when you need/want/expect them to? She never napped, went to bed late, and woke up at her usual time – on the button – every morning. I was afraid to go anywhere because who knew when she’d spontaneously combust? And look, here we are, still smiling after more than 48 hours of just the two of us and not nearly enough sleep. Miracles do occur! Isn’t it a thing of beauty?!?! This is one of the most delectable things you will ever encounter, and I just had to share it. ***This recipe was posted on my previous blog, back in the dark ages of Xanga, a few years ago. I just pulled it out to make for my birthday dinner and, once again, it was too good not to share. 3 cups marinara sauce (one 15oz jar of Prego works in a pinch, though you didn’t hear that from this Italian girl!). Saute cubed eggplant and garlic in olive oil, salt & pepper. Cool. Brown Italian sausage (casings removed) with red wine to cook together. Cool. Boil water and cook angel hair pasta 1-2 minutes. Mix the above together and add parmesan reggiano, mozzarella, and marinara sauce. 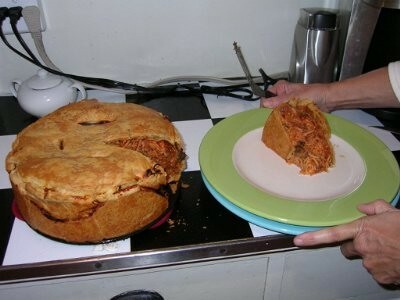 Line bottom & sides of a springform pan with thawed puff pastry – reserve a piece to put over the top. Dump the pasta mixture into the pan, top with pastry and seal. Cut slits in the top and bake for 1½ hours at 375. You will never regret the experience, or the time you put in to make it. Oh, and you should invite company – it feeds an army! I think I remember that line from a Strawberry Shortcake cartoon of my youth, but regardless of where it came from it ran through my head incessantly Saturday afternoon. He was so warm, and so generous. “We actually don’t open until tomorrow, but let’s see if we can set you up, anyway.” Three buckets later we had our fill of lovely pesticide-free organic strawberries, for which Paul charged us only the fee for 1 1/2. Perhaps this is because many [most] of Olive’s berries were still green… but trust me, she had eaten plenty of ripe ones, too. But beyond the heaven of fresh food and warm earth was Paul Otten. He welcomed us heartily and spoiled us rotten with horrendous discounts – we came home with freshly picked lettuce, tomato plants, potted basil and oregano, a flat of zinnias and our two boxes of strawberries (which, unfortunately, I decided to wait until the next day to slice up and freeze – and since they haven’t been genetically engineered to keep well for cross-country travel, many of them grew mold. I still have enough for jamming, though, thank heavens, and we’d already eaten our fill). All this for a mere pittance. AND he gave gardening and composting advice and hooked me up with someone who could help me get my garden plot soil in tip-top shape! I’m in love! 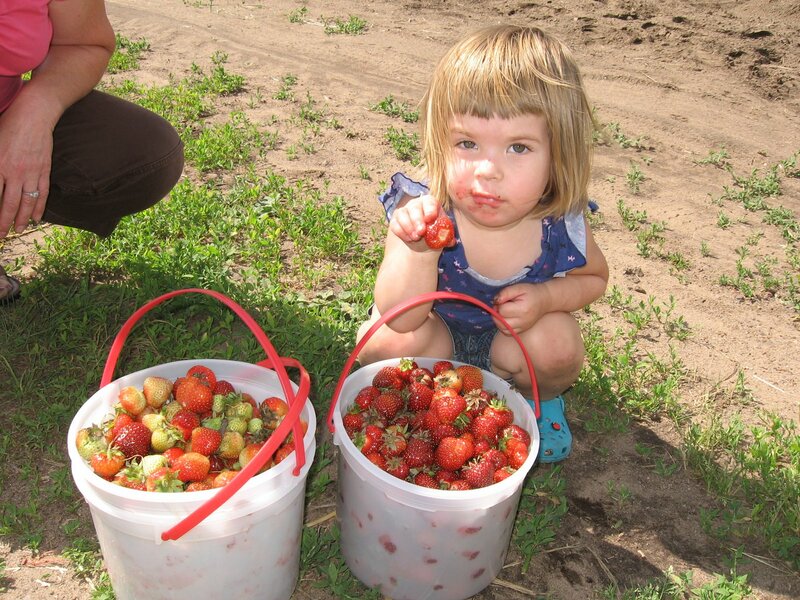 So, out of the vast generosity and spoil of the weekend, I continue the giving spirit by sharing with you the world-famous recipe we make each year with our freshly picked strawberries…. fresh fruit - strawberries, peaches, blueberries, whatever sounds good to you. Whip heavy whipping cream till stiff peaks form. Beat together cream cheese and sugar. Beat together the whipped cream and cream cheese mixture. Crack out a springform pan and line the edges with ladyfingers. Put a small bit of the cream mixture down on the bottom of the pan, then use half the remaining ladyfingers to layer across the bottom of the pan. Spread half the cream mixture over the top, then layer the rest of the ladyfingers and the rest of the cream mixture. Top it off with fresh fruit. Add nutmeg and baking powder. Pour batter into two 8-inch round pans (line the bottom with wax paper first). Bake 30 minutes at 350 degrees (until the cakes are lightly browned and firm in the middle). Chill the frosting until the cakes are ready to frost. When the cakes are cooled, place one on the serving dish and frost the top. 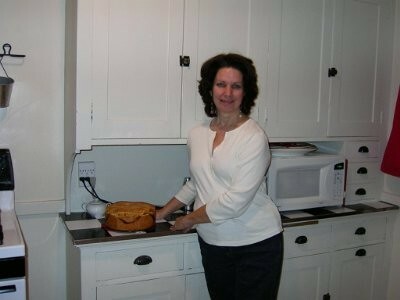 Then place the second cake on top and frost the entire outside. Enjoy! This is rich and refreshing and all-around amazing. 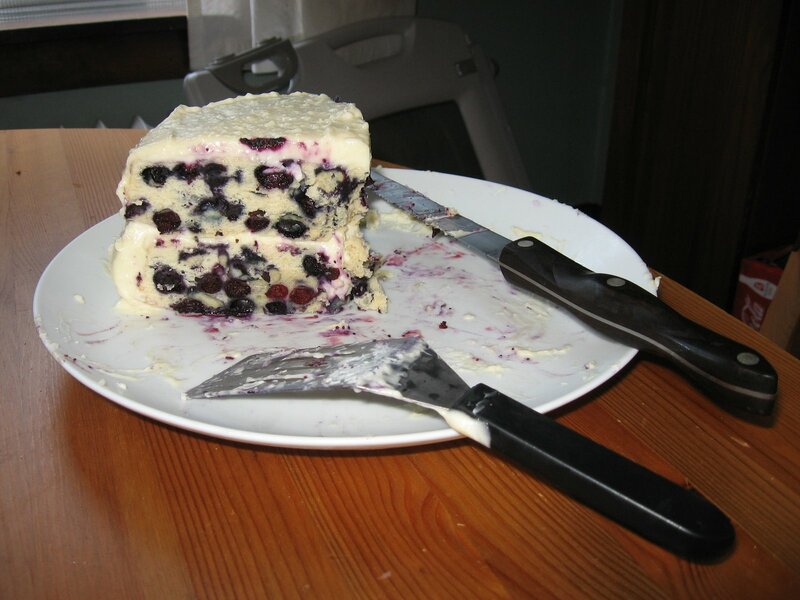 ***Although J said we could just as easily eat a vat of the frosting with fresh blueberries and do away with all the baking. 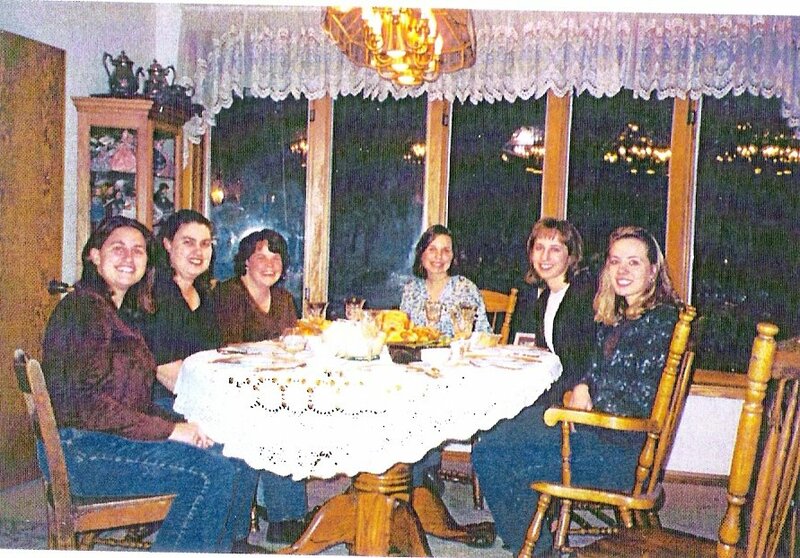 For a year in my twenties I lived with three lovely ladies (who I still adore) in a hilltop house that was perfect for entertaining… so we did. A lot. And, to be honest, we weren’t the best cooks ever – we rarely followed recipes, chose the most difficult things we could to make (with no practice rounds, naturally), and we nearly always had a substitution or two. BUT we were fabulous hostesses (if I do say so myself). We were the Greenfield Girls, living on Greenfield Drive overlooking all of El Cajon, California – which, while not the most highbrow location on the coast (understatement), was awfully pretty when viewed from a distance. Like from our back windows and yard. Despite our various challenges, there were many lovely brunches, dinners, parties, showers… and I have a homemade cookbook to prove it (replete with pictures). Theresa and I decided to document it all when Michele got married, so recipes, stories and pictures were assembled together – just for the four of us. A week or so ago this Italian lady I sometimes watch Saturday mornings on PBS was making palachinke, and it brought to memory a Greenfield Girl experience. 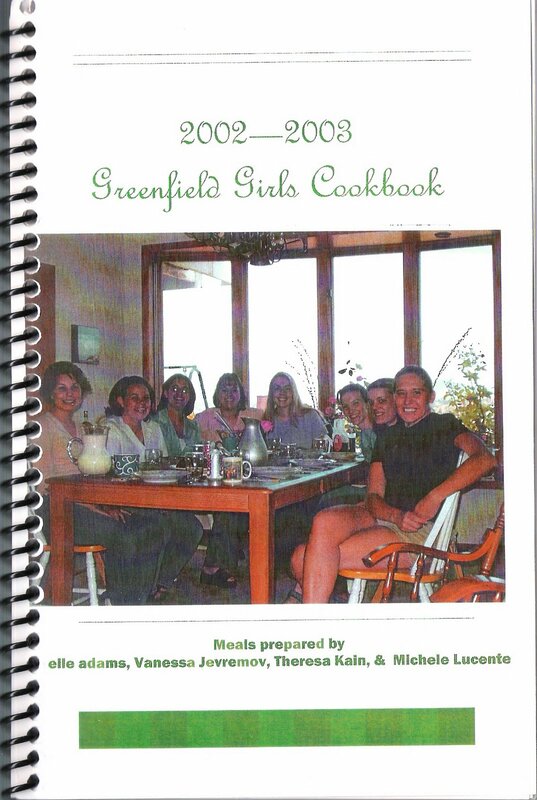 Vanessa, the fourth Greenfield Girl, made these once – a little piece of her Yugoslavian heritage. Basically, I think, palachinke are crepes with a better name – thin, pancakey things you can slather with butter, sugar, jam, nutella, or your sweet of choice and then devour. Never one to pass up an opportunity to cook something fun (that’s the Greenfield Girl way), these were our Father’s Day treat today. And, should you want an adventure, they can now be yours. Blend all ingredients till there are no lumps. Melt a pinch of Crisco (butter flavor is great) in the pan. Pour a thin coat of batter into the pan, and move the pan around so it coats the bottom. Flip once the edges get good and browned and there are bubbles coming through; cook a couple of minutes on the other side. Serve warm with your choice of topping (we used cinnamon sugar and blueberries). As you venture into the cooking world, there are some important factors to remember. First, you survived a year of cooking in the Greenfield Drive kitchen. This means that you overcame missing ingredients, over-cooked and under-cooked food (but never dangerously so! ), too many ingredients and not enough ingredients. You survived piles of dishes and improvising what dishes were to be used to carry all of the food. Remember: You are a survivor. Whatever disasters come your way, based upon your Greenfield Girl experience, you can rest assured that you will come through on the other side, and that you will be blessed with a true treasure: A MEMORY. This is an absolute favorite around here – my adaptation of a recipe I found in Cooking Light. My mom rearranged it into her own version – it’s very versatile and absolutely delicious. Perfect for brunches, potlucks, showers – good hot or cold. Cook pasta according to directions and toss with some olive oil. Heat some olive oil in a pan, add zucchini and cook until tender. Add garlic and cook another three minutes. Stir in everything else but the cheese. Stir in pasta and cheeses. Proudly powered by WordPress | Theme: Stitch by Caroline Moore.